Because I run every day, I also shave every day. (Am I the only one who can’t stand that itchy pinchy feeling when those short new stubble hairs get caught in your pants?) When a person shaves every day they tend to go through a lot of razors. I’m not, in general, a frugal person. I don’t pay that much attention to the price tags when we go grocery shopping because I feel, we need to eat, so stressing about how much it costs to eat doesn’t really do me much good. Also, my husband does most of our grocery shopping, so that helps me ignore expensive grocery prices as well. However, every once and a while I will scan our grocery receipt before I toss it in the garbage and the big ticket items usually jump out at me. Do you know what big ticket item always jumps out? The razors! That tiny little box of 4 razors that we buy at least monthly costs nearly $20! I decided there has to be a better way so I went on a search. You could order your razors on Amazon for about the same price and with subscribe and save you might save a buck or two. I did that for a while, but still, I wasn’t in love. The price of razors from a shave club are cheaper than you will find in stores (or on Amazon). Prices will vary depending on which shave club you choose, which razor you select, and if you want any additional products (like shave butter, for example). Dollar Shave Club offers 5 of their super basic razor heads for just $1 a month! These razors are nothing to write home about and not exactly my preference, but you can’t beat that price. They also offer two “higher end” razor head options for just a little more each month. I was paying at least $15 for a 4 pack of 5-blade razor heads at the store, and I can get a very comparable set shipped for free to my mailbox for just $9 a month. Yes, please! All Girl Shave Club is another great option with prices starting at $10 every two months for 6 razor cartridges. You just can’t beat these kinds of prices. When you buy a pack of razors in the store you get a really expensive pack of razors. But when you join a shave club, you not only get your razors, but you get an experience. This might sound silly, but the shave clubs have made shaving exciting again! 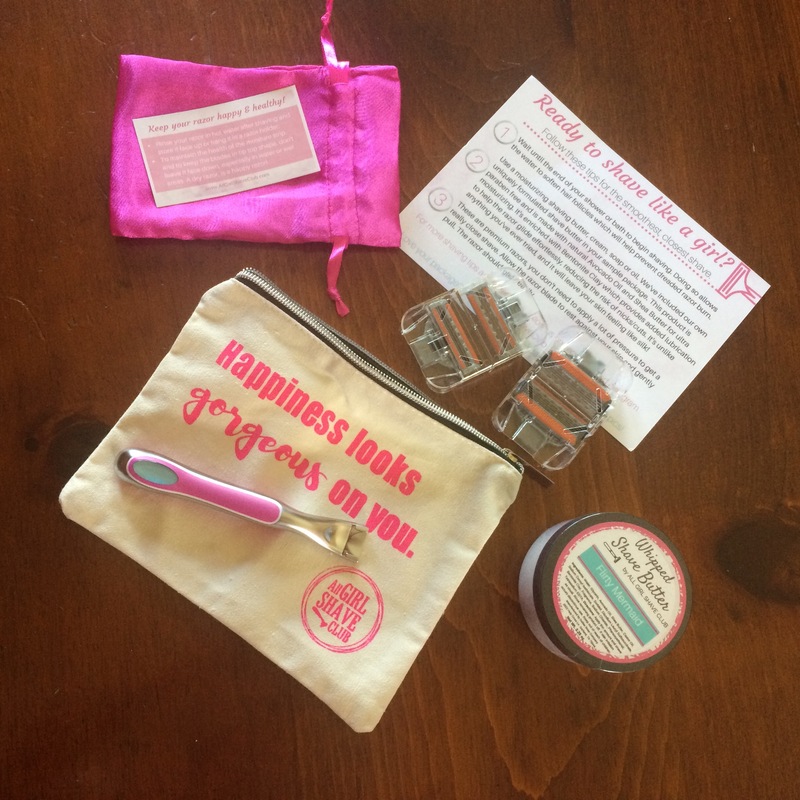 All Girl Shave Club has a Discovery Box option that includes not only your razor cartridges but 2-3 unique shaving or body products with each bi-monthly shipment. They also send you a cute little tote bag and your cartridges come in a pink silky drawstring. It’s so fun to be surprised with new products to try each month to make shower time feel a little more like pampering. The Dollar Shave Club is definitely geared toward men, but the razors work great for women as well. 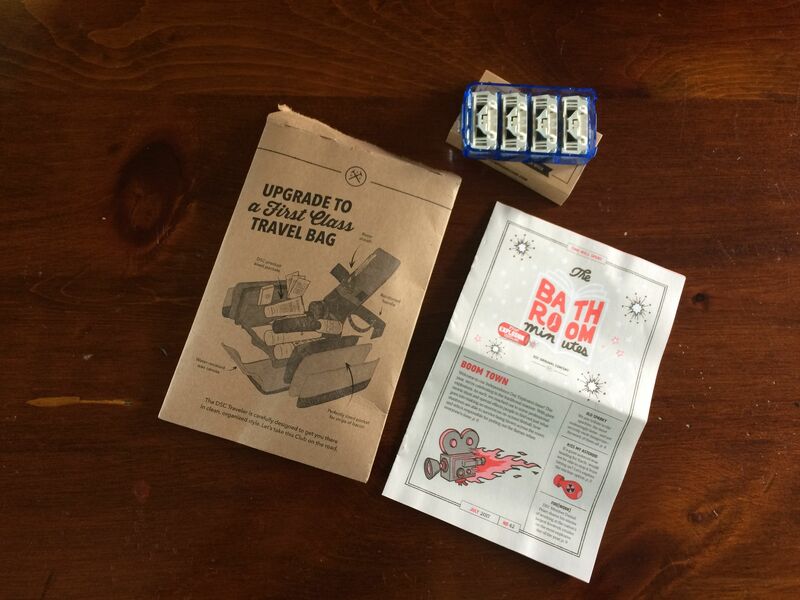 When they ship your new pack of cartridges they always include an issue of “The Bathroom Minutes” which is a small printed magazine/newspaper with funny or witty articles to read. They also have an assortment of body products (again, mostly geared for men) that can be included with your shipment. I have a belief that I work crazy hard so I can play crazy hard. I do not desire to spend my very limited free time doing boring and monotonous things. This is why I pay someone to clean my house, I shop online as often as possible, and my husband does most of the in store shopping in our house. This momma works a full-time job, blogs part time, cooks and cleans up after slobs, runs every day, and rarely has time for a good night’s sleep. The more things in my life I can set on autopilot, the better. Once you find a shave club that you like and pick the membership level that best meets your needs, you never have to think about it again. You receive fresh new razors in your mailbox and there is a constant supply just waiting for you. It’s wonderful. No more trying to remember to add them to your grocery list or making a late night run to the store so you can have fresh legs in the morning. They just magically keep resupplying themselves. So beautiful. Shave club memberships are set to keep going continuously so you don’t have to think about it, but the beautiful thing is that you can stop or change them up at any time. You aren’t locked into a yearly membership or any kind of intense commitment. You simply log into your account to pause, adjust, or cancel your membership. 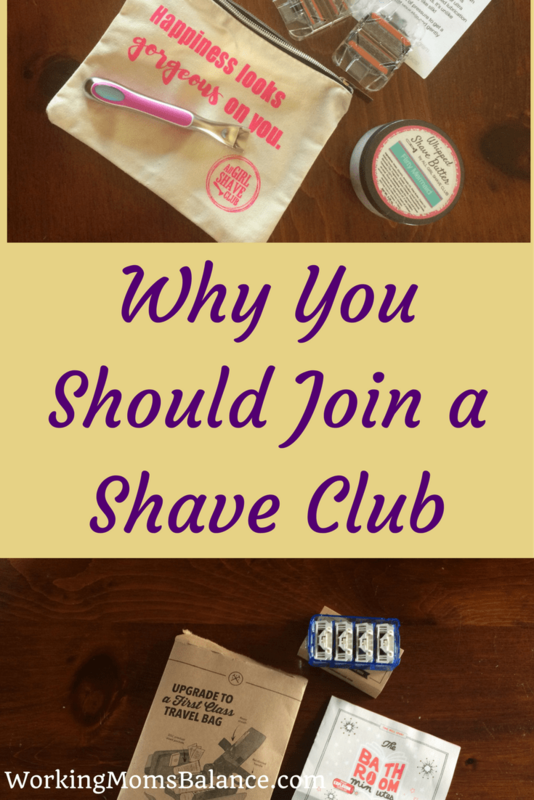 Have you tried a shave club membership? Currently, we have a membership to both Dollar Shave Club and All Girl Shave Club. I started with DSC for myself about a year ago. The razors are great quality and I loved the experience. My husband switched over to Dollar Shave Club razors as well. You can order an extra handle at any time, so we don’t have to share. I heard about All Girl Shave Club a few months ago and wanted to try them out because I wanted a more “girly” experience and I felt it was good to support a woman entrepreneur. I am loving the All Girl Shave Club for myself. The razors are pink instead of boring silver/black/blue like I was getting with DSC. And the Shave butter and other products are amazing! The quality of the razors from both clubs is about the same. We like our razors to be super high quality, so we have “The Executive” cartridges from DCS and the “5 blade babe” from All Girl Shave Club. Since we each have our own membership now, we get a shipment from each club every other month and it seems to be working out well so we always have cartridges available, but we don’t have an oversupply. You can get 10% off a new membership through All Girl Shave Club if you sign up through this link. They also have a sample kit if you just want to try them out before you jump right into a membership. But remember, the membership doesn’t lock you into anything as you can cancel at any time. Have you ever considered joining a shave club? What is your favorite part about your shave club membership? Let us know in the comments.